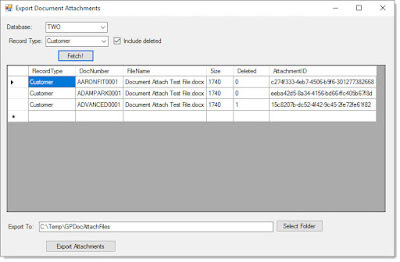 I'm working with a customer to automate the import of Document Attachments into Dynamics GP. As part of the testing process, we are having to clear out all of the test attachments that have been imported so that we can re-import them again. In case it's of interest to anyone, here are some SQL scripts I created to delete out ALL document attachments for ALL payables transactions. 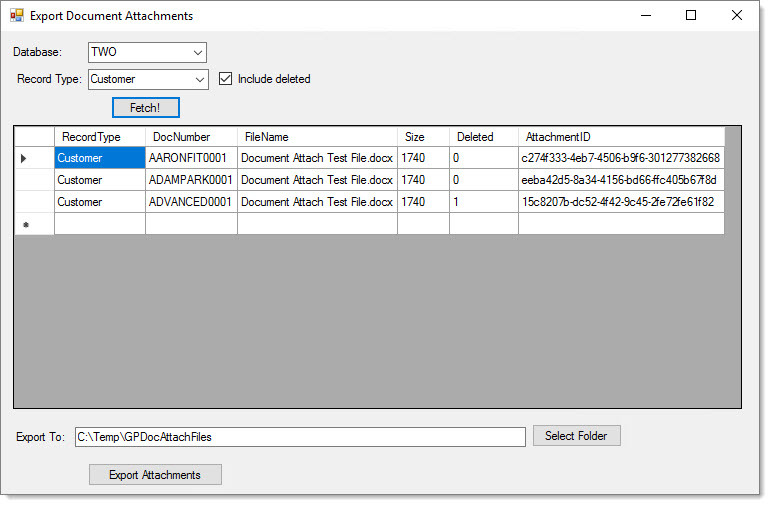 You can modify the scripts to remove attachments for other record types. Make sure to backup your company database before running any of these scripts. If you find any mistakes or problems with these scripts, please let me know. I have been working on a few Dynamics GP Document Attach projects lately, and I haven't been able to find a complete list of the record type codes used in the Doc Attach tables. Here's the partial list that I've compiled so far for a US installation of Dynamics GP. As I test additional record types, I'll update this list. If anyone knows of a complete list or has updates, let me know. **NOTE: It appears that some of the Doc Attach record type codes may vary by region. For example, UK installations use "Creditor" instead of "Vendor". But "CC" is still used for UK Customers, rather than "Debtor".